Your morning roundup for Jan. 2, the day we learned you're not that tall. Got any stories or photos for us? Tip your editors. 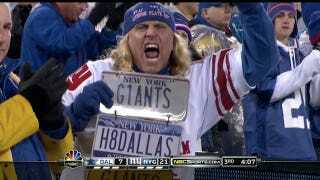 What we watched: Cowboys at Giants. In case you were wondering, the Giants are a dangerous playoff team peaking at the right time, Eli Manning knows how to win this time of year, and Tom Coughlin is actually a great coach. Enjoy the playoffs. What we're watching (all times EST, unless noted): New York at Philadelphia in the Winter Classic at 1 (NBC) [UPDATE: Moved to 3 p.m.]. Michigan State vs. Georgia in the Outback Bowl (ABC), Ohio State vs. Florida in the Gator Bowl (ESPN2) and Nebraska vs. South Carolina in the Capitol One Bowl at 1 (ESPN). Wisconsin vs. Oregon in the Rose Bowl at 5 (ESPN). Stanford vs. Oklahoma State in the Fiesta Bowl at 8:30 (ESPN).